Our popular Whisky Lounge and cafe occupies part of our former malting house. A welcoming yet stylish retreat, with hand-crafted furniture, large sofas and a cosy fireplace, it also has a feature archive wall, with vintage memorabilia, signs and advertising, telling the Dewar’s story. It’s a great place to linger and soak up the atmosphere, and has become a popular Aberfeldy lunch venue in its own right. Our beautiful slate whisky bar offers an enviable selection from the John Dewar & Sons Fine Scotch Whisky Emporium portfolio, with Dewar’s blended Scotch whiskies and Aberfeldy single malt and single cask whiskies, as well as malts from Craigellachie, Royal Brackla, Aultmore, and The Deveron. This means you can visit the distillery and enjoy our whiskies without taking part in a tour if you so desire. Cocktails and low-alcohol whisky highballs are also available. Our cafe boasts an extensive selection of freshly prepared hot and cold dishes based on great locally sourced ingredients. As well as being convenient for our visitors, our cafe has become a popular Aberfeldy lunch venue with locals and visitors alike. 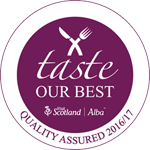 We are quality assured by VisitScotland’s ‘Taste Our Best’ scheme, recognising our promotion of good quality local food suppliers.